It's always super exciting to have something published. 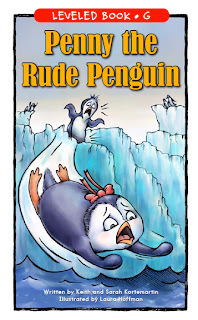 I worked on this project, "Penny the Rude Penguin" this spring for Learning A-Z and now it's out. This was my second project for them - and there were no revisions which is always a miracle. They said they loved it, which makes me happy. Penny thinks it’s funny when other penguins fall down. Sometimes, she even knocks them over on purpose just to see them fall. She says she is sorry afterward, but she doesn’t really mean it. One day, Penny herself gets bumped and falls down—way down. Suddenly, it’s not so funny anymore! It's about bullies and friendship - a theme that resonated with me since I was a bullied kid when I was little; I was small for my age, painfully shy and awkward. The audience is for first graders - it's a leveled reader. Here are some of the pages. After approval of final rough sketches (done in pencil) I used Pitt pens and Microns, then painted the project in "Digital Water" (Thank you, Prof. Cliff Cramp) then layering in textures with lots of transparency in Photoshop. Some painting was done in Corel Painter and some was done in Photoshop. I love to blend traditional media with digital media. 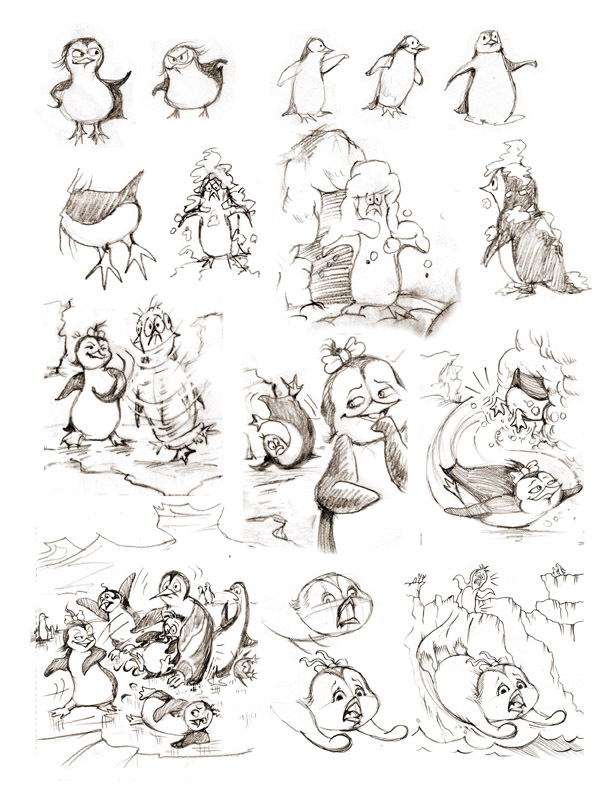 Set in Antarctica, I favored a cooler palette, favoring complimentary colors in blues and oranges. The biggest challenge for me in this project, was to keep the characters consistent. 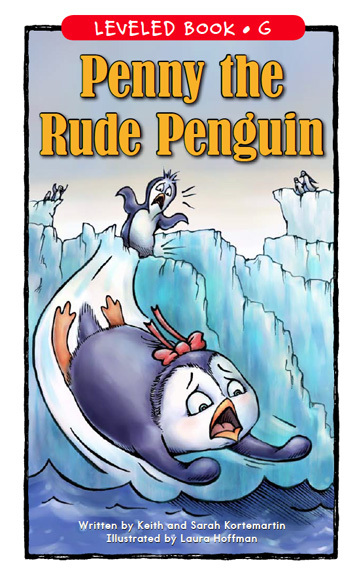 Penny, the rude little snot of a penguin is identified by her little flippy red ribbon, her snarky smirk and her chubbiness. 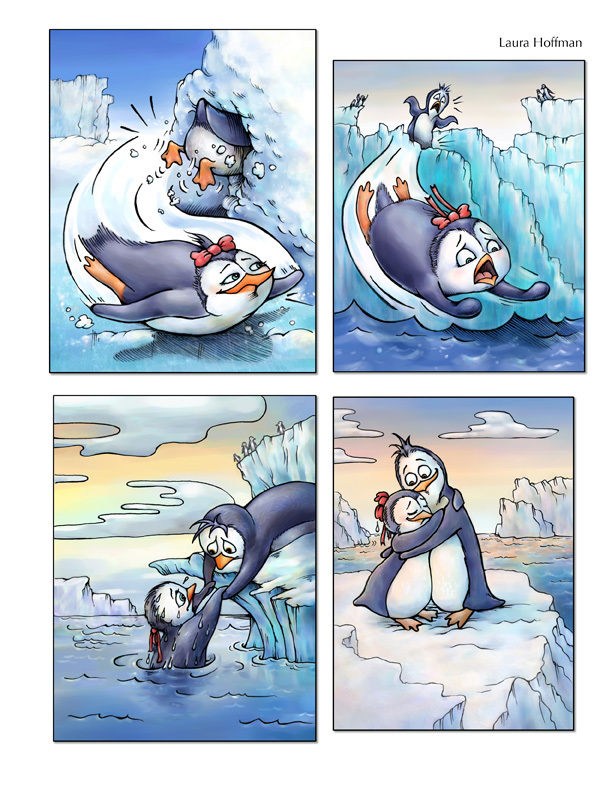 She still has her baby-penguin fat. Peter, her long-suffering friend is taller and leaner. He is identified by his wide eyes and long spikey top hairs (he uses hair gel). The characters always seem to come alive for me while working on a project. From start to finish, I like to show subtle changes in the time of day. You will see the color palette turning warmer as she finally "gets it" after being such a pain to her friend Peter, and his family. The last panel shows the colors of sunset as she realizes her friend Peter could see behind her general rudeness. It was a cute project. Look for more, coming soon. Next, I'll share the first project we did together that stars a moose! Love illustrating with animal characters!